In the big image, we're looking south, up Death Canyon, with Death Canyon Shelf on the right. 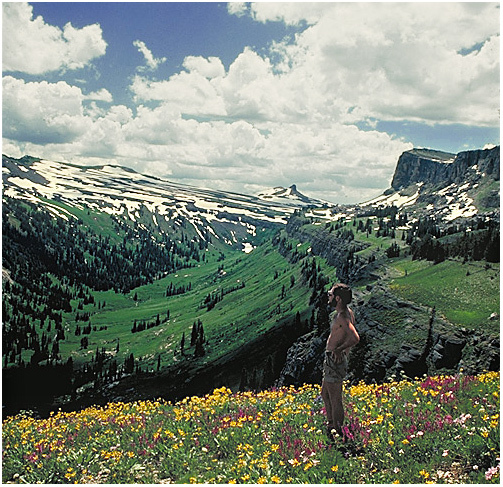 A trail from Heaven itself winds along this shelf, you wade through wildflowers and listen to Marmots and pikas as you dream along in your lazy walk. Far below, if the wind is just right and you pause to listen, you can hear the wild creek far below in the canyon. The quiet is sublime, but, look, into the sky above, and be well aware of big thunderheads developing. By late afternoon this exposed shelf could get excitingly dangerous! 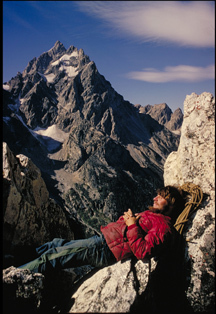 In the picture below, I am basking atop Symmetry Spire, looking across Cascade Canyon at the Grand Teton towering more than 3,000 ft. higher than I am. This is an old picture, look at the Goldline rope under my head!